If you’ve driven by the Walker Art Center in Minneapolis recently, you may have noticed that traffic is a bit slower and more “cozy” than normal. If you’re in a rush, this may seem like a pain, but it’s all for a good purpose: the Walker is undergoing major renovations in order to bring you a much more lavish, unified, and contemporary museum. A preview of what the new Walker will look like when all the renovations are finished. The construction is set to finish in the summer of 2017. However, during this time the museum is still open. And even more exciting, it is unveiling its new entrance December 1 with a free open house that will be packed with events and looks to be a big party for people of all ages. The event lasts all weekend and, in case that word didn’t sink in, is completely and totally free. Some of the activities include the Extrapolation Factory, a workshop about exploring different ways to interact with our environment on this planet; live music by Minneapolis band Saltee; free gallery admission throughout the weekend; and free films in the Bentson Mediatheque room. Saltee, the Minneapolis-based band playing on Thursday night. Although these activities are going on throughout the weekend of December 1 to December 4, it seems that Thursday is the night to be there if you have some extra time. Not only is there a cocktail hour from 5:00 to 9:00 p.m. in the Bazinet Main Lobby, there is also a conversation with Walker executive director Olga Viso, Joan Soranno and John Cook of HGA Architects and Engineers, and Thomas Fisher of the Minnesota Design Center. 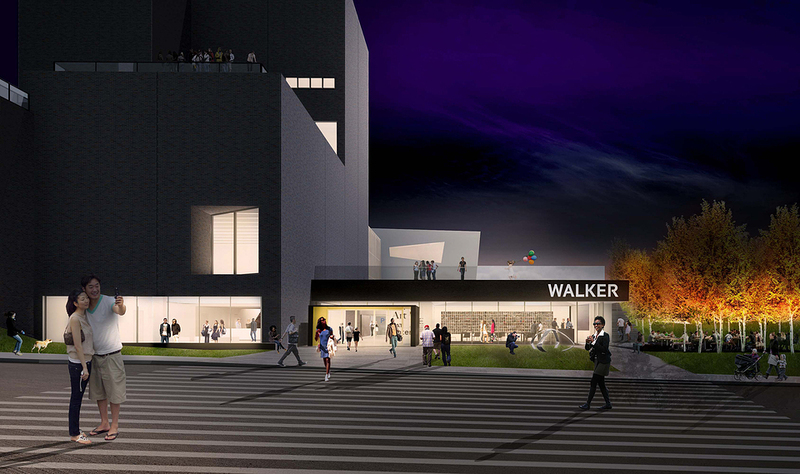 Annie Cleveland, chief of marketing and strategic communications at the Walker Art Center, expressed excitement for the unveiling of this new entrance. “We’re just celebrating that the dust has left the building,” she said. Another exciting part about the new Walker that Cleveland talked about was the new restaurant that is opening in mid-December. It sounds like the restaurant will have enjoyable cocktails to sip on after a day of looking at art and browsing the galleries. Although it won’t yet be open during the open house this weekend, you’ll at least be able to get a glimpse of what it will look like. For more information about the open house and the other events occurring this weekend, visit the Facebook page here. For more information about the other renovations, visit walkertart.org/campus. Justin is a writer, traveler, reader, and connoisseur of horror films. He likes to explore the Twin Cities, go to punk shows, and bar-hop in Northeast Minneapolis—sometimes exactly in that order, sometimes not in that order at all. I won’t be in the Minneapolis area for the opening, but I’m looking forward to the renovations.